LONDON — Kit Kat is piggybacking on the release of the new James Bond film "Spectre" with a tactical poster ad that winks at the spy's love life. 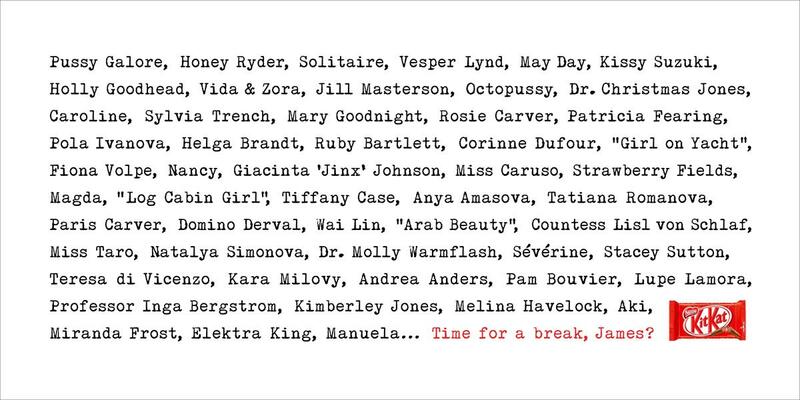 J. Walter Thompson London created the poster, which lists all of the main Bond girls from the movie franchise’s 53-year history before asking: "Time for a break, James?" The ad plays on the Nestlé brand’s long-standing motto: "Have a break, have a Kit Kat." (Kit Kat is manufactured by Nestlé globally — except in the US, where the candy is made by Hershey.) It will appear on a 48-sheet poster site in Camden, London, and on a digital projector on the platform at Oxford Circus Tube station, next to a poster promoting "Spectre."